Following Talir’s cryptic warning, Eilyn and Kaleb journey to the distant Praxis Arcanum to consult with the mages there. 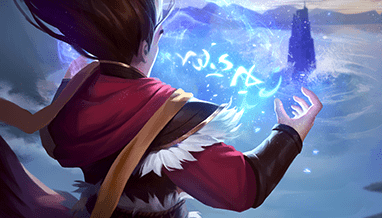 Join their pilgrimage in next week’s Chapter 22: Distant Visions, and earn yourself a new premium card back! When you join the Distant Visions League, you’ll get eight packs: 3 packs of The Fall of Argenport, 3 packs of Omens of the Past, and 2 packs of The Empty Throne. Everyone who participates will receive the new Distant Visions card back upon conclusion of the League. The cost to participate in September’s League will be 12,500 Gold or 1,100 Gems. The Chapter 22: Distant Visions League begins tomorrow and will run through Sunday, September 30.